Who knew key lime pie was actually simple to make? Simpler than lemon meringue pie. The filling is made from just 3 ingredients: key lime juice, sweetened condensed milk and egg yolks. These ingredients are mixed together, poured into a blind-baked pie shell and baked for 20 minutes. The hardest part is squeezing the massive amount of tiny key limes required to get the required volume of juice. It’s a marathon for your small finger muscles. If you can, find an assistant. 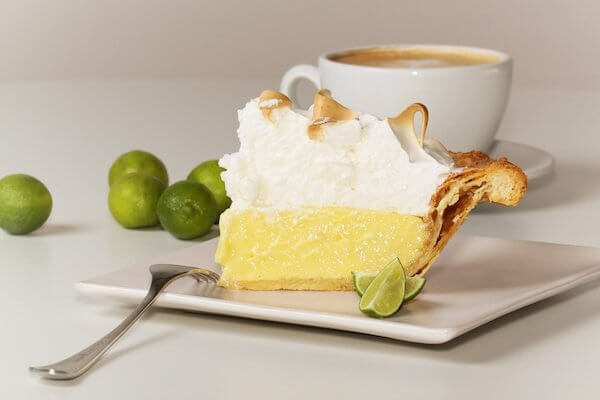 Some key lime pie recipes call for a whipped cream topping and others call for meringue. My preference is meringue. While I’ve gone crazy in the past and made sky-high Italian meringue, this time I made a more sensible Swiss meringue. It still towers above a regular meringue, but is much simpler to prepare. The egg whites and sugar are whisked over a double-boiler until hot, then whipped in a stand mixer until you have stiff peaks. Pour onto the pie and bake until the peaks turn golden brown. The pie needs to chill thoroughly (5 hours) before serving, so make sure you plan ahead!